Experts in: Printed Electronics, In-Mold Electronics, In-Mold Decorating, Graphic Overlays, Labels, Nameplates, Insulators/Gaskets and Touch Screens. Times Change. Our commitment to happy customers doesn’t. We specialize in both decorative and functional labels and decals that can be used to either promote your brand, enhance the appearance of your product, draw attention, or warn an operator of a potential hazard. Our team will work with you to customize your labels to your unique requirements, using our attention grabbing effects and endless choices of color; giving your parts the image and durability they deserve. We utilize both our expertise and technology to integrate functionality with form. Our customized In- Mold Electronics (IME) combine all of the benefits of In-Mold Decorating (IMD) with printed, conductive inks, creating a unique solution to user experiences. Our team will work closely with you from prototype to testing and volume production, fulfilling your specifications with quality and cost savings. We offer customized In- Mold Decorating (IMD) solutions using cutting edge technology. Decorating a part during the molding cycle can save you time, money and resources, and not to mention design flexibility and long-lasting graphics as the label and mold become one. Put our experience and industry knowledge to work for you to reduce your decorating costs and improve your graphics durability. A User Interface, also called a “UI” or an “Interface,” is the means in which a person interacts, engages with, or controls a device. A UI is the single most important element of your device. Feature-wise, a good interface provides an efficient and user-friendly way for a person to operate that device, allowing for a smooth completion of any task. With the innovation of new technologies, manufactures may find it difficult to know what type of user interface design would work best for their products, and often times the user experience is often overlooked. We are here to help you through those challenges. Our variety of user-interface technologies enables us to give your product the look, feel and most importantly, the best user- experience you require. 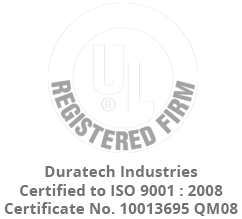 You always have easy access to the DuraTech Industries staff for all your label, nameplate and membrane switch projects. Save time and money by using on-site bin stocking of labels, onsite lunch-and-learns and our full-service design and engineering.